Installation and project management services now available for Rocketail rear aerodynamic tail systems for semi-trailers. Velociti Inc., a global provider of technology design, deployment and support services, today announced it has been named the preferred provider of installation services by Rocketail LLC, makers of advanced, aerodynamic tail systems for semi-trailers. With the agreement, fleets deploying Rocketail rear drag reduction technology will be able to use Velociti’s nationwide network of highly experienced and qualified mobile technicians. The Rocketail Wing System for semi-trailers (Patent No. US 9,708,017 B1) is a verified EPA SmartWay trailer rear fairing technology that has exhibited a certified fuel efficiency improvement of over 3.58 U.S. gallons per 1,000 miles. Featuring an advanced aerodynamic wing design, the Rocketail Wing extends only 12 inches from the rear of the trailer, eliminating a main cause of rear collision damage. Fully integrated with the trailer door, the Rocketail Wings are always deployed using unique industrial-grade cable hinges that lock the wings in their maximum aerodynamic open position each time the doors are closed. 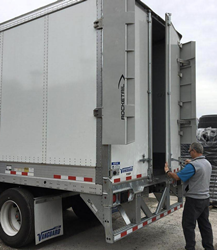 The system shifts the wings flush with the sides of the trailer each time the doors are opened, allowing the doors to swing a full 270 degrees without being blocked. Rocketail, LLC manufactures today’s most advanced, aerodynamic tail system for reducing rear drag on modern semi-trailers. The company’s patented Rocketail Wing is designed to solve the Three D’s of rear aerodynamics -- Drag, Deployment, and Damage. The SmartWay verified technology improves fuel efficiency with the least overall cost in parts and maintenance. The Rocketail System has successfully completed third party testing in the United States and Canada to certify performance and is now being installed by major fleets across North America. Rocketail is headquartered in San Diego, CA and has a field office in Logan, UT. For more information, visit http://www.rocketail.com. Velociti is a global provider of technology deployment services specializing in the installation and service of a broad range of transportation and networking technology products. Velociti’s experience allows enterprise level technology consumers to maximize ROI as a result of leveraging expert, rapid deployment. Velociti clients include many Fortune 500 companies from a wide variety of market segments such as transportation, retail, distribution, manufacturing, healthcare, government, education, food service and public venues. For more information visit http://www.velociti.com or call toll free (855)-233-7210.